A project kickoff tends to begin with emotional extremes. Sometimes you’re the most excited you’ve ever been in your life, and sometimes you reach a level of procrastination not yet acknowledged by mortals. Whichever state you identify with, it’s no secret that beginning a new project is time consuming. You’re probably staring at a giant list of to-do’s, including time, scope, budget, goals—not to mention the best way to organize it all with a heavy dose of teamwork. Tackling something so impactful is both daunting and exciting, so what’s a good tactic to just get started? No, retail therapy isn’t the answer (this time). We’re talking about a project planning technique called T-shirt Sizing, something that Trello’s content team uses all the time! Organizing your ideas or project tasks into various sizes not only helps you understand the overall scope (i.e. the big picture) of what you’re trying to accomplish but, most importantly, it helps your team understand everyone’s perspective on the tasks at hand and what they consider their bandwidth to be for their assigned work. 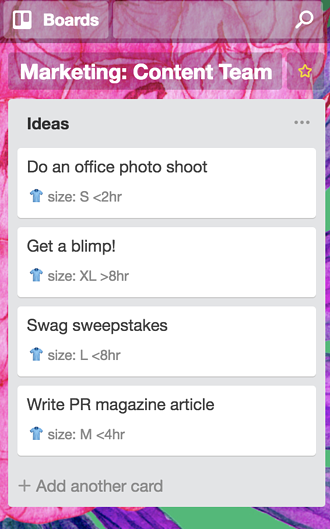 Breaking out t-shirt sizes into lists is a great first step towards organizing project tasks in Trello. 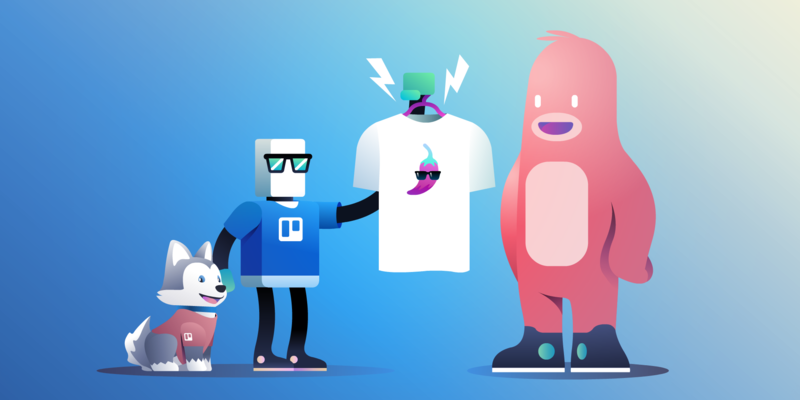 The T-shirt Sizing method allows your team’s creativity to shine before getting bogged down by the feeling that “this is a specific commitment of 5 hours or 3 sprints’ worth of team time.” At Trello, we like to make our most over-the-top ideas an XL. Think: Having Beyonce mention us in her latest album or sponsoring a satellite to spell out “Trello” on the moon (NASA, if you’re reading this DM us). You get the idea 😉. What this exercise does is help contextualize what a small, medium, and large project should be like, and makes sure everyone on your team is generally on the same page about the scope. Yes, it’s not likely we’ll be on a superstar’s music album, but there is a possibility of having a guest speaker do a podcast episode. And the moon? Maybe not, but what about the possibility of Times Square? Not so crazy now, huh? A common pitfall that teams can fall into is “Scope Creep,” which is when innocent-looking garnishes are snuck in once the initial plan is already in action. T-shirt Sizing your ideas helps combat this slow expansion of work by being able to discuss the parameters of your project before Scope Creep settles in. If you find your team veering off course, it’s easy to point to the fact that the project is now a large instead of the medium everyone had agreed upon. Get back on track! There are other ways to scope out a project: Some teams might use time estimates, while others may assign a numerical point value in a Fibonacci sequence (0, 0.5, 1, 2, 3, 5, 8, etc.) to various tasks depending on a combination of their difficulty and size—these are called story points. For example, writing a blog post could equate to 5 points while writing a novel could be considered 100 points. A points system helps a team prioritize what they can accomplish based on the total points they have available in their workload for the project. 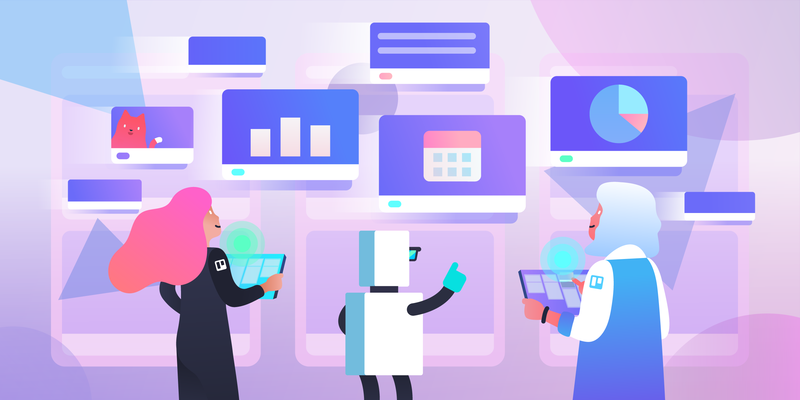 However, the caveat is that it can take teams some time to develop an accurate understanding of the value behind those points, or maybe your team just doesn’t need to subscribe to a full-blown agile model of project management. With T-shirt Sizing, there isn’t a mathematical formula to differentiate between what defines an XL or a small, but there is a general understanding of what that difference in scope size means. This loose structure makes T-shirt Sizing a great way to begin your planning process without too much formality or over-thinking, instead looking at rough estimations of the investment of time and resources for each project idea. 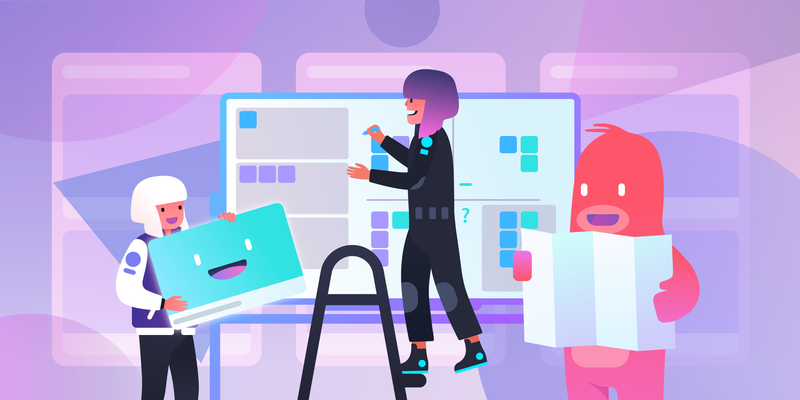 Let’s say you’ve had a brainstorming sesh, concocted some solid ideas with the team, and are now inputting your notes into Trello—how exactly do you organize your t-shirt sizes on your board? With the Custom Fields Power-Up, it’s easier than choosing an actual t-shirt from your closet and bringing it to your next meeting. Once you’ve added the Power-Up to your board, customize the field with the sizes and parameters that make sense for your team. We like to use the “Dropdown” custom field, adding an option for each size of shirt. For instance, on my team at Trello, an XL task is something that takes eight or more hours (basically more than one dedicated workday) to complete. 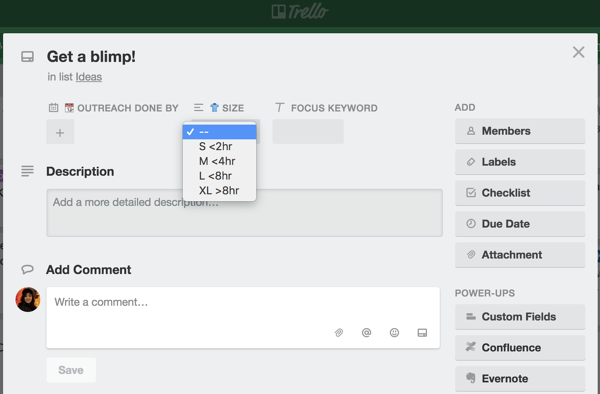 You can set basic time parameters like that to help your team agree upon the definition of your sizes. We created a custom t-shirt field with sizes and hours that match what we consider different sizes of work. Once you’ve assigned your cards to the appropriate t-shirt sizes, it’s now easy for another team member or manager to quickly glance at your list and immediately get an understanding of how large (or small) an undertaking may be. Now you have yourself a list that not only helps with your existing project but also a list of temporarily “discarded” ideas that can come in handy for future projects. Lastly, want to see all your small projects listed at the top and your large projects at the bottom, rather than in random order? The popular Butler Power-Up allows for you to quickly make rules and automatically have your cards reorganized in the order in which you’d like. 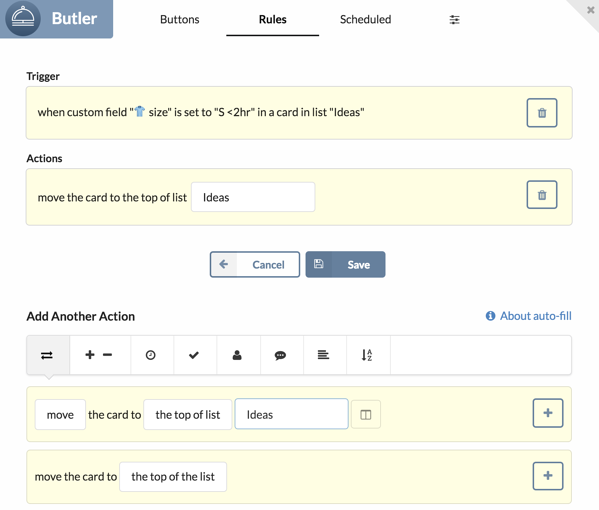 The Butler Power-Up allows you to make rules for custom fields, card order, and more. T-shirt Sizing isn’t just for one type of team, it is wholly applicable for everything from design projects to sales deals, to figuring out your next vacation. However, the do’s and dont’s of T-shirt Sizing are the same no matter what project you use it toward. Think big: Allow yourself to dream a bit with this exercise. Coming down to a feasible idea will be the end result, so don’t worry about specifics upfront. Make sure the mission isn’t changing: With so many ideas, it’s easy to get off track and stray from the point. A birthday party could easily veer into a carnival if you’re not careful, so be sure to check that each size is accomplishing what you need. 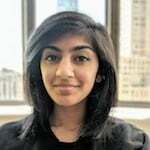 Have too many sizes: A common mistake teams will make is to overcomplicate a process that was meant to simplify. It’s recommended that no more than 3-4 sizes should be discussed. Whether it’s analysis paralysis or just a too-many-cooks-in-the-kitchen situation, overthinking and over-detailing too early in the planning process can lead to productivity demise. Putting your ideas into generalized buckets not only helps with team communication but also forces you to prioritize what’s truly important in your project. Get out there and put your thinking cap t-shirt on!